Indian food has experienced unprecedented popularity in Utah in recent years, mostly because a steady stream of Indian restaurants have opened up in Utah’s biggest cities over the past few decades. And these restaurants are serving up some authentically delicious options. How could you not dream of garlic naan and mango lassi? Here are the best Indian restaurants in the state! People reference Bombay House in casual conversation, as if everyone should know exactly where it is, and exactly what to order there—that is how much people love this spot. Luckily, the restaurant now has three locations in Utah (Provo, Salt Lake City, and West Jordan), so if you find yourself in Utah’s most populated regions, you should definitely check out this place to confirm its supremacy. If you frequent Utah Valley restaurants, you will soon learn that there is an ongoing argument between Indian cuisine lovers in the area: Bombay House or India Palace? In addition to their other locations, both restaurants have locations in Provo that are situated relatively close to each other. So the question is: which one should you go to? In this case, it depends on what you’re looking for. If you’re looking for a phenomenally delicious and affordable lunch special, India Palace is your place. Star of India has been around since 1990 and specializes in Northern Indian cuisine, which essentially includes all of the well-known Indian favorites, including authentic Tandoori cooking, chicken curry, lamb, seafood, halal meat, and vegetable-based entrees. In addition to its impressive savory menu, Star of India is also well known for its dessert menu, which features gulab jamun and India’s dense, ice cream equivalent called mango kulfi. India House is a laid-back Indian restaurant in the Salt Lake City suburb of Sandy, that is touted by many as some of Utah’s most authentic—and most delicious—Indian food. 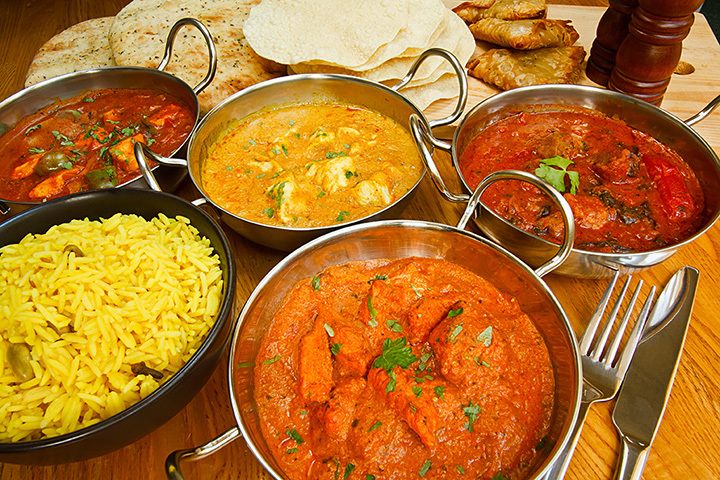 India House is well-known for its lunch buffet, which is available Monday through Friday at $8.99 per person. Also specialized in North Indian cuisine, the restaurant has a varied menu that features a good number of recognizable dishes, making it a good place to take Indian food newbies. Sitara India is a homey restaurant in Ogden whose vibes make Indian food feel like the ultimate comfort food. Who needs mac and cheese or French fries when you can have tikka masala and samosas? If you’re feeling more adventurous than the classic Indian staples that Americans love to obsess over, Sitara India also has a good number of Southern Indian specials that will give you a taste of something new. Ganesh Indian Cuisine has a big following in Utah, partly because it has three locations (American Fork, Park City, and Midvale) but also because it consistently delivers on quality and quantity. Yes, even its buffet doesn’t skimp on quality, which is really saying something when you consider how difficult it is to maintain the quality of buffet food. A sit-down experience at Ganesh is equally pleasurable, and the restaurant’s catering services are worth looking into if you have an event coming up. You’ll feel at home at one of Saffron Valley’s three locations (Salt Lake City, Sugar House, South Jordan) almost immediately, and the restaurant’s staff is friendly and attentive. The restaurant’s Sugar House location even has an in-house mini market, selling Indian-themed gifts, chai tea blends, clothing, and Indian cooking ingredients. The food at Tadka is, simply put, good for the soul. The restaurant’s owners moved to Utah in 2006 and have effectively created a little piece of India in the middle of a traditional Utah farming town. The food at Tadka is delicious, well-priced, and consistent. If you get the chance to venture south and try this place, you should. Like Sitara India in Ogden, Royal India makes a point of offering both Northern and Southern Indian dishes, rather than focusing specifically on Northern Indian cuisine. This distinguishing factor makes Royal India a unique restaurant in its own right, especially in the context of Utah’s other Indian restaurants. Founded in 1998, Royal India has seen tremendous success over the past two decades and has established itself as one of Utah’s go-to Indian restaurants. The restaurant’s chef is serious about his craft, and you’ll be seriously glad if you give the restaurant a chance. Indian Oven, a beloved restaurant in Cache Valley that, according to its devoted followers, beats out Indian food even in big cities like San Francisco and Los Angeles. There are only great things to say about this excellent restaurant.